A select group of air hostesses did the catwalk , showing off their talent as a fashion model in a downtown Seoul hotel recently. Mr. Justin Murray, country manager Korea of Cathay Pacific Airways Ltd., held a fashion show event in Grand Hyatt Hotel Seoul's Regency Room on Jan. 25, 2006. A total of 10 stewardesses from Cathay Pacific were mobilized for the "Cathay Pacific Uniform Fashion Show," to commemorate the launching of its fifth daily flight between Seoul and Hong Kong. The show attracted a number of spectators as well as photo journalists. 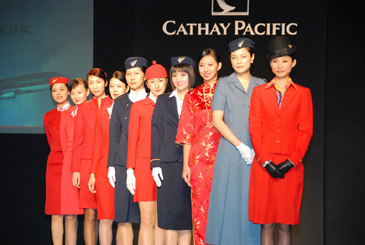 The "amateur models" displayed all the Cathay Pacific's uniforms of the past and present for 30 minutes. The select flight attendants were mostly South Korean and other Asian countries. Presently, Cathay Pacific Airways runs four daily flights between Seoul and Hong Kong. On Jan. 27, 2006, the fifth daily flight was added, making the Hong Kong-based airline running most flights between Seoul and the former British colony. During the event Mr. Murray took some time to meet with The Seoul Times journalist to tell more about the Cathay Pacific. The following are the questions and answers with him. Q1: Tell me what your "Walking on Air" show is all about? What's the purpose of the show? A1: The show is primarily a fashion show, but it also tells the history of Cathay Pacific . It's performed by our own cabin crew and not professional models. So we show people the different uniforms from when Cathay first started flying. This year is Cathay's 60th anniversary, so we're showing off six decades of uniforms . Q2: I heard that you came to Seoul three years ago. What are your major achievements as Cathay Pacific's Seoul chief so far? How did you like your life here? A2: I'll answer the second one first. I like Korea very much. I grew up in Hong Kong. I lived in Taiwan, Beijing, and Hong Kong before, but this is my first time in Seoul. So, it was a pleasant surprise when I first came to Korea. Major ahivements? We continue to grow the business in Korea, and over the last few years we still steadly sales growth. One of things we have been trying to introduce is new destinations to Koreans. For example, when Koreans think about Australia usually only think about one place which Sydney, but there're actually many nice destinations in Australia, for example Cairns and Perth. So we are trying to introduce new destinations and some of the new places like that. Q3: How many of your entire flight attendants are from Korea? A3:We have 300 Korean crew. We always have several Korean crew on our flights from Seoul to Hiong Kong to take care of korean passengers. Q4: What are the criteria of your selecting cabin crew? A4:Very good question! The most important criteria is service. Are they able to deliver a kind of service that we're looking for? At Cathay we talk about service straight from the heart. So, we're looking for people who really understand how to look after customers and look after passengers. Q5: Compared with other airlines what are the characteristics of your attendants? A5: I think the difference with the Cathay Pacific crew from the other Airlines is the consistancy of the service. Many airlines have a good service as well. I don't think many have as good as Cathay Pacific. Last year, we won the airline of the year award. One of the reason is the quality of the service which is consistantly good. Q6: What are your goals as Korea regional manager of Cathay Pacific in year 2006? A6:The goals are pretty similar with the last year. We'll continue to grow the business and continue to introduce new destinations to Koreans. We are also improving the competitivenes of our company here in Korea and introducing new initiatives to to build a healthy, happy, and fun place to work for our staff. We have approx one hundred people in Korea. Who is Mr. Justin Murray? 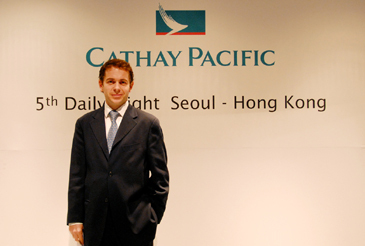 Mr. Justin Murray took the helm as Cathay Pacific's country manager in Korea on August 4, 2003. Born in 1969 in Bangkok, Thailand as British citizen, Mr. Murray graduated from Edinburgh University with Asian studies major in 1992. Since his graduation Mr. Murray has been working mostly in Asia — China, Hong Kong, Taiwan. He built his career in areas of banking, distribution and auto sales. Prior to his mission in Seoul, Mr. Murray served in Cathay Pacific Airways Planning Department. 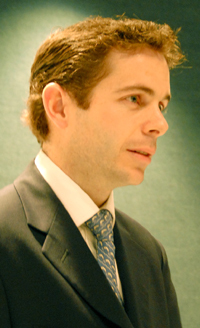 He also Country Manager in Amsterdam with responsibility for the Benelux and Scandinavia region. Mr. Murray is married and has two children. He speaks Mandarin fluently. Cathay Pacific Airways — Cathay, the ancient name for China; and Pacific, because the far-sighted Farrell speculated that one day the embryonic airline might fly across the Pacific ocean. Boeing 747-400 service from Vancouver to Hong Kong, daily non-stops to New York and daily direct A340-300 service from Toronto to Honk Kong, offers service to 47 destinations from its "Super Hub" in Honk Kong. For details or inquiries please contact Mr. Yu Kwang-Sung, director of IntNet Co., at 82-2-516-4007 or Miss Lee Eun-Kyung, marketing communications supervisor of Cathay Pacific at 82-2-311-2732. Miss. Judith (Joo-Eun) Park serves as staff reporter of The Seoul Times. She majored in Chinese at Hanshin University in Suwon. She covers diplomatic community in Seoul. Miss Park also covers travel and hotel areas.